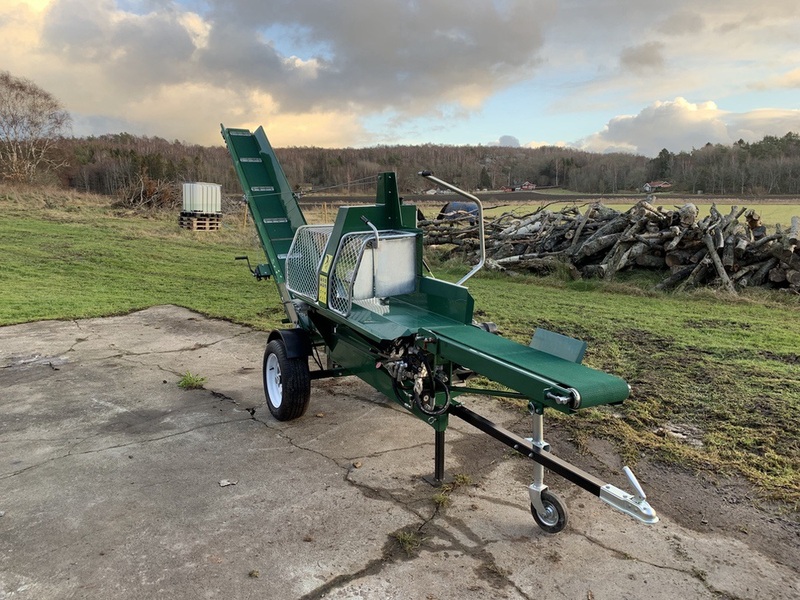 The Woodland firewood processor is a simple and safe to use product designed to cut and split your logs into firewood. 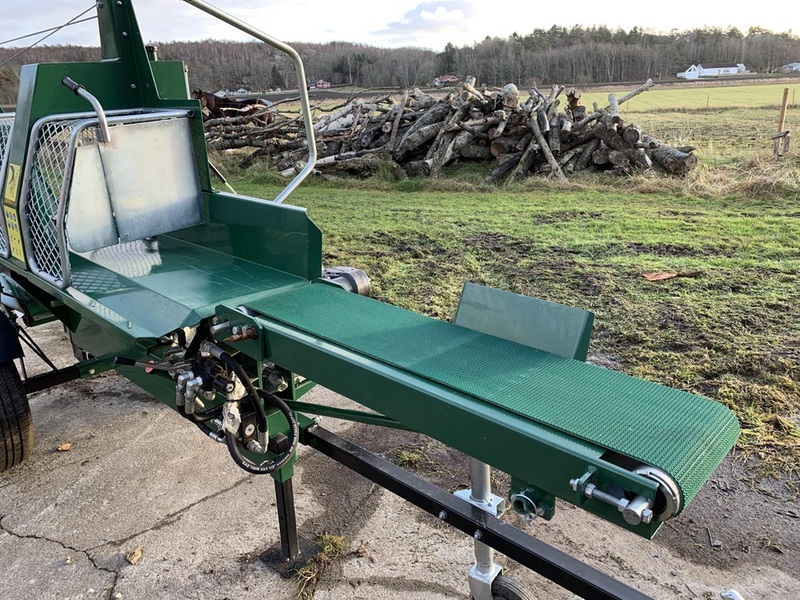 Simply load your log on the roller table, advance the log to the preset length (9″ - 23″ / 23 cm - 58 cm), pull down the chainsaw bar handle to cut the log and then advance the ram to split it in either half or quarters depending on whether you use the 2 or 4 way splitter. Both are included. The ram automatically extends and retracts, ready for the next piece. The split firewood then advances up the hydraulically driven conveyor system to make large piles. The conveyor is great for piling your wood into bins, trailers or trucks, thus eliminating multiple handling and saving you ALOT of time! The height of the conveyor can be adjusted to multiple heights simply by using the winch to raise and lower it. It can also be folded in half for easy storage or transport. The conveyor itself is 10″ (25cm) wide and 10′ 6″ (3.2m) long. The rolling log table can also be folded up for transport and storage, reducing the overall footprint when not in use. Even the tongue of the processor is removable for storage. 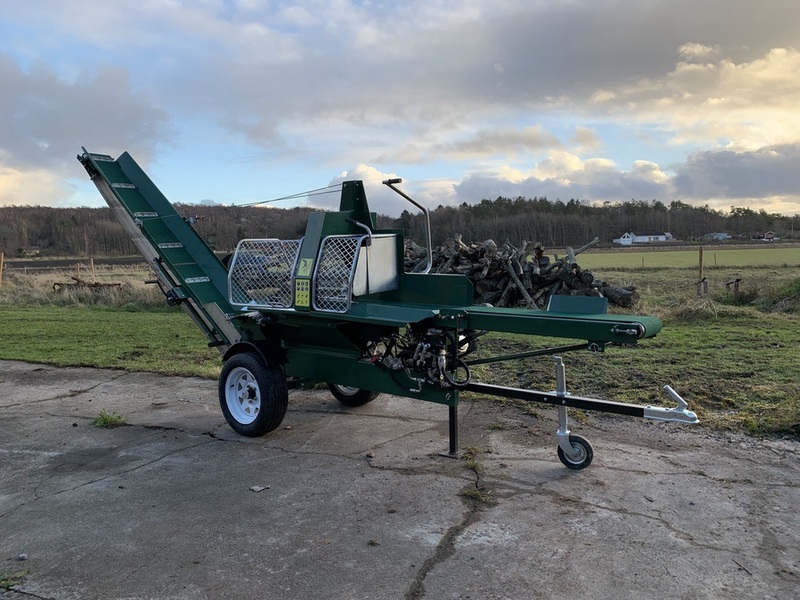 The Woodland processor is capable of cutting 15″ (38cm) diameter logs and up to 10 ‘ (3m) in length. The log can be cut into lengths between 9″ - 23″ / 23 cm - 58 cm. The 12 ton ram splits the wood against the standard 2/4 way splitter (cuts wood in 2 or 4 pieces) before reaching the 10″ (25cm) wide and 10′ 6″ (3m) length long conveyor system for piling. 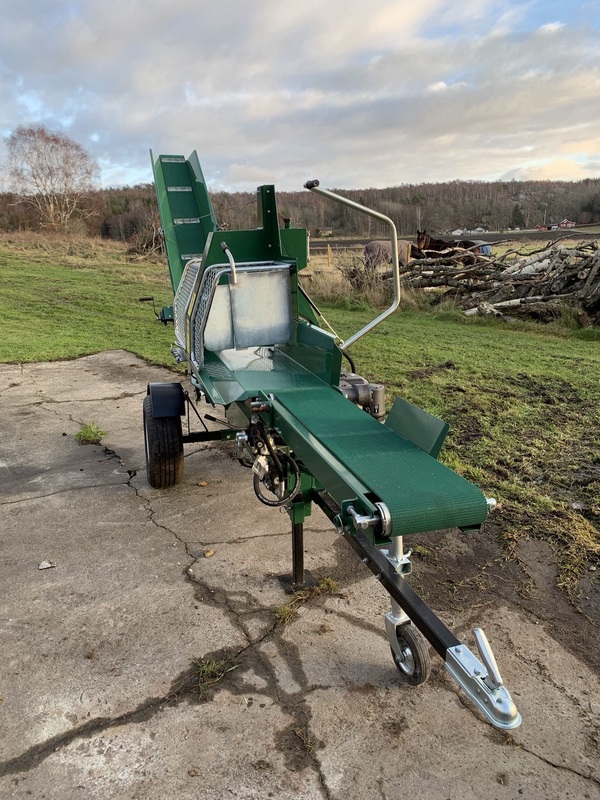 18″ (46cm) chainsaw bar for the Woodland FP160 Firewood Processor. Designed to be used in conjunction with a 0.058″ x 0.325″ x 76" (0.147 cm x 0.825 cm x 193 cm) chain. The chainsaw bar is hydraulically driven, meaning you do not need to supply your own chainsaw. This provides a much quieter and easier to operate system than processors that require the use of chainsaw.